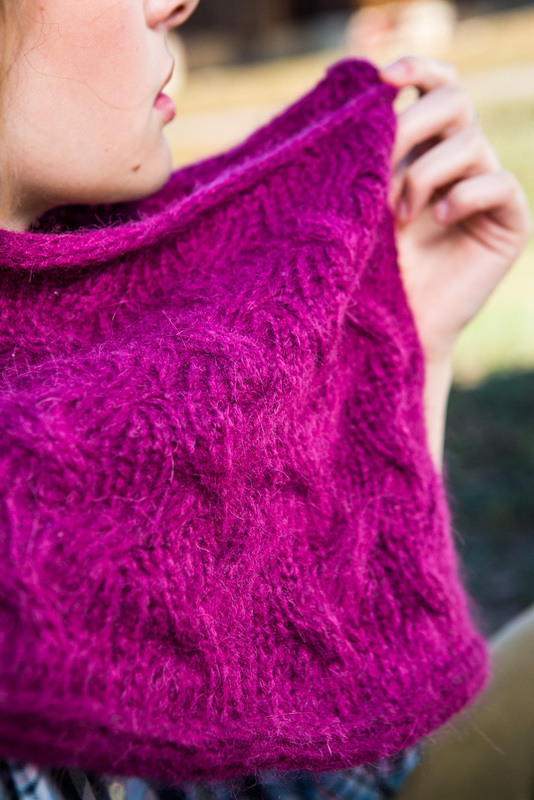 Gentle cables make a luscious fabric with a light, fluffy yarn such as Berroco Kodiak. This piece can be worn elegantly draped around the neck cowl-style or pulled over the shoulders for a sweet capelet look. 27 1/2” (70 cm) top circumference, 40” (101.5 cm) bottom circumference, and 11 1/2” (29 cm) long. 253 yd (231 m) bulky weight (#5 Bulky). Shown here: Berroco Kodiak (61% baby alpaca, 24% nylon, 15% merino wool; 125 yd 115 m/50 g): color #7020 Crowberry, 3 balls. Size U.S. 7 (4.5 mm): 24” (60 cm) circular (cir) and pair of double-pointed (dpn). Size U.S. 9 (5.5 mm): 24” (60 cm) circular (cir). Size U.S. 101⁄2 (6.5 mm): 24” (60 cm) circular (cir). Size U.S. 11 (8 mm) 32” (80 cm) circular (cir). Marker (m); cable needle (cn); tapestry needle. 16 sts and 23 rnds = 4” (10 cm) over cable patt using size U.S. 9 (5.5 mm) needle. 121⁄2 sts and 18 rnds = 4” (10 cm) over cable patt using size U.S. 11 (8 mm) needle.